These insects fed on nectar and pollinized gymnosperm plants 105 million year ago. When we think about pollination, the image that comes first to mind is a bee or a butterfly covered by pollen. However, in the Cretaceous —about 105 million years ago— bees and butterflies did not exist, and most terrestrial ecosystems were dominated by non-flowering plants (gymnosperms). An international research team has recently discovered some amber fly specimens in El Soplao cave (Cantabria, Spain). According to an article published in the prestigious scientific journal Current Biology, these specimens fed on nectar and pollinized gymnosperm plants 105 million years ago. Plants attract insects with different strategies —for example, with their sweet and nutritious nectar— in order to get them transport pollen and enable the process of pollination. In this way, plants and insects establish a fundamental symbiotic relationship that plays a key role in the preservation of terrestrial ecosystems. Besides bees and other similar species, the most important pollinators in current ecosystems —where flowering plants predominate— are proboscid butterflies, beetles, thrips and flies. On the contrary, in Cretaceous landscapes, dominant species were gymnosperms (for examples, pines, firs, cycads) and the main agent of pollination was the wind. Amber from El Soplao (Cantabria) is providing traces of new insect species key to understanding life in Cretaceous forests, when today's Iberian Peninsula was a giant island. 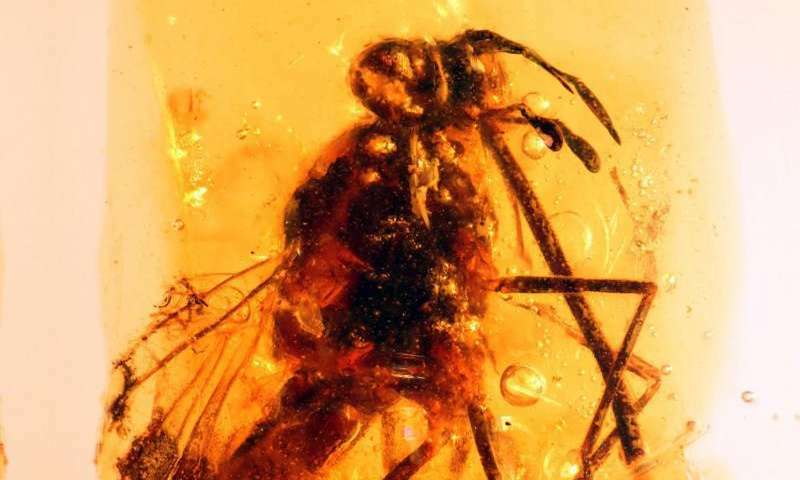 The study describes two species of flies, well preserved in amber, which present a long specialized proboscis and belong to the family Zhangsolvidae, extinct before dinosaurs. One of the specimens has hundreds of grains from a Bennettitalean species, an extinct order of gymnosperms. The study proves that the internal structure of flies' proboscis has been preserved at a microscopic level, according to evidence provided by computed tomography and transmission electron microscopy. The scientific team has showed that these flies took nectar from plants by approaching them in beating flight, like hummingbirds do. There are few known cases of insects fossilized when they were transporting pollen from one flower to another. The new fossils found in Cantabria show that flies and Bennettitales held a close partnership 105 million years ago. Why have amber insects carrying angiosperm pollen not been found? According to experts, this is an outstanding scientific finding, because during that period, angiosperms were beginning to dominate terrestrial ecosystems and diversify in many species. "If insects were able to feed on gymnosperms flower structures, it is probably true that the transition to angiosperms took place then," say the authors of the study. "The study describes two species of flies, well preserved in amber, which present a long specialized proboscis and belong to the family Zhangsolvidae, extinct before dinosaurs"
If the amber insects existed in the Cretaceous how could the be extinct before dinosaurs? A clumsy sentence that should have said the flies went extinct before the dinosaurs went extinct.